I’m so excited that you’re doing your project on photography! You, of course, know that the Rule of Thirds isn’t an actual “rule”; it’s just a standard for composing good images, whether in photography, painting, drawing… any visual art form, really. 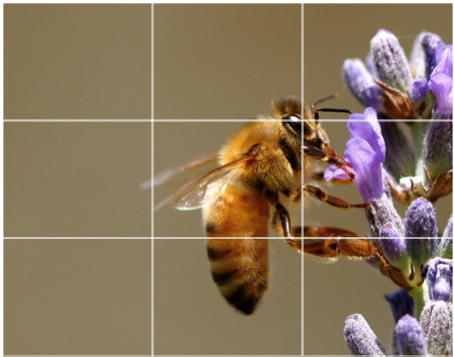 The idea is that, if you drew a grid on your image, separating the image into thirds, your focal point would exist on one of the gridlines — never dead center, or too far off to one side or the other. You can take any highly-acclaimed piece of art, create a grid of thirds over the piece (both vertically and horizontally), and you’ll almost always find that the subject of the piece weighs heavily around those third-lines. …and it is, vertically! But if you drew three horizontal lines over the photographs, separating it into thirds from top to bottom, you’ll find that, while the couple is centered vertically, horizontally they are in the bottom third of the photograph. Okay, so I’ve followed the Rule of Thirds here. But WHY? Well, if I perfectly centered the couple, there would be a whole bunch of space below their feet that… well, it just wouldn’t matter or be interesting or add anything to the photograph. As it is, the “negative space” (all that non-crucial space above their heads) IS interesting, because it shows us the arch of the window they’re sitting in, and gives you a sense of the scene. So the top two-thirds of the photo still contribute something to the overall image, even though the subject only exists in the lower one-third of the photo. 1. This is clearly meant to be a journalistic (or “story-telling”) photo. I’m at a party, I’m photographing the party events as they happen… my subjects should never be looking directly into the camera! 2. The subject is small in the photo, and the other stuff in the image doesn’t directly contribute to the value of the photo. 3. The subject is perfectly centered in the very middle of the image. This image DOES tell a story. There is clearly a party going on, as demonstrated by the drinks and the crowd of people surrounding the woman. And the woman is being silly — she WANTS the camera to notice her, she’s cheesing for the camera, she is intentionally being goofy. And that goofiness is enhanced by me centering her in the frame. Now her silliness, and the fun of the event, is particularly evident. It’s like you just got punched square in the nose with silliness. This is why I kept the photo, why I made it the way it is, and why I think it’s sometimes okay to break the Rule of Thirds. In this photo, the subject is far into the right third of the photograph — definitely further than the one-third gridline would fall! Now, I would have preferred for the bride and her dad to be a little bit further to the left in this shot, but I had to make a decision: compose the photo so that my subject was exactly on a third-line, OR capture the full wagon wheel on the left side of the photo. I chose to push the subject a bit further to the right than would be typical and include more of the wagon wheel, because I felt like that told a more important story. For me, the Rule of Thirds is an important compositional TOOL — but it should never take precedence over capturing the moment and telling the story I want to tell. I haven’t really looked into this, but I’m thinking it’s possible that painters and drawers probably use the Rule of Thirds much more strictly, because they have complete control over where the subject will occur in their artwork. With photography, however, you are sometimes at the whims of your subject, or your scene. You may not be able to control the height of the window where the couple is sitting, or whether the party guests are equally distributed on either side of your frame, or where the bride is walking in relation to the wagon. I think that experienced photographers learn to compensate for these things without even thinking about it — I know I have in many cases! It isn’t until I sit down and analyze my images (like I’m doing for you here now) that I see how the Rule of Thirds impacts all of my work — even when I choose to break it! I hope this gives you some of the insight you were looking for! I read this article and found it very interesting, thought it might be something for you. The article is called Dear Melia: The Rule of Thirds and is located at https://annesimone.co/dear-melia-the-rule-of-thirds/.